Tickets ($30 each) for this event are available at the Logan Center Box Office. Ticket purchase includes a copy of Think like a freak, which will be available at the Logan Center the day of the event. Please call the Logan Box Office at 773.702.2787 or click here to order your tickets. A signing will follow the event. Seating is limited. This dynamic, essential book, will turn your brain inside out, teaching you how to Think like a freak. Levitt and Dubner analyze the decisions we make, the plans we create, and the morals we choose and show how their insights can be applied to daily life to make smarter, harder, and better decisions. Stephen J. Dubner is an award-winning author, journalist, and radio and TV personality. He quit his first career—as an almost-rock-star—to become a writer. He has worked for The New York Times and published three non-Freakonomics books. He lives with his family in New York City. Steven D. Levitt's book Think Like a Freak was available from LibraryThing Early Reviewers. 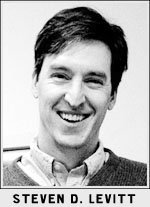 Steven D. Levitt is currently considered a "single author." If one or more works are by a distinct, homonymous authors, go ahead and split the author. Steven D. Levitt is composed of 15 names. You can examine and separate out names.